We'll Credit You $25 For Every New Customer Your Refer! Each new customer you refer will save $25.00 on their first order. All they have to do is call us at 1-800-PELLETS (735-5387) to place their order, and tell us that you referred them. And as a way of saying thanks, you'll receive a $25.00 Pellet Bucks credit towards your next fuel purchase. There is no limit to the Pellet Bucks you can earn! In fact, we've had many customers earn hundreds of Pellet Bucks by simply posting this offer on facebook! Thanks for putting a good word in for us! Your Pellet Bucks are issued after your friend’s fuel is delivered. 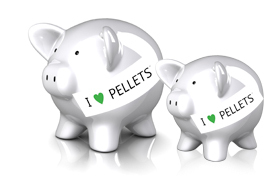 Your Pellet Bucks apply to a future order, and may be combined. Pellet Bucks may not be redeemed for cash. Your friend must be a new customer with a new delivery address in order for you to earn Pellet Bucks. We will verify that all Pellet Bucks referrals are new customers. There's no limit to how many Pellet Bucks you can earn! It's like getting 10 free bags of fuel for every friend you refer!